Once you have signed up for the Online Store, you can start adding your products and customizing your settings! Once you’ve logged into your ECWID account, click on Online Store in the top menu. In the setup screen, click on the blue “Add a product” button. The product setup dialog box provides a variety of options. For now, we’ll just be adding a single product, and include basic details, an image, inventory information and product options. You can edit the product’s category, options, images, tax and shipping information at a later stage. To add a new product, click "*New product" in the top-left corner of the Products dialog box. In the General window, you can enter the basic product details. Weight, lbs: Weight is important for shipping, as carriers calculate their rates by product weight. Shipping and handling are charged separately to the product. In addition to this, not assigning a product weight means that your online store will regard your product it as an intangible item, such as a digital download, and will not calculate and display a shipping rate at checkout. Name: Your product's name. You can change this at any time. Product Image: Scroll down the page to locate the image upload area. You can upload a single image via this screen. Tip: Once you've saved your product details, you can upload a gallery of images for your product, in the "Gallery" tab. Click System Settings in the top-right corner. Click on the Weight unit drop-down menu. Change the weight unit you'd like to use. The Online Store also allows you to add a variety of options to your product. For example, if you are selling coffee beans, you can add options for the different size bags you sell. When customers click to buy a bag of coffee beans, they’ll be prompted to choose a size and will also see the price difference between the various options. 1. Click on Options at the top of the Product dialog box. 2. Click on New Option. 3. Describe your option (e.g., different weight bags for your coffee beans). 4. Enter the price of each option. 5. Select the display options from the Input Type menu. To read more about each option take a look at the Ecwid Products topics. The Online Store integrates with a large number of payment gateways (for the full list, click here: Payment Options). 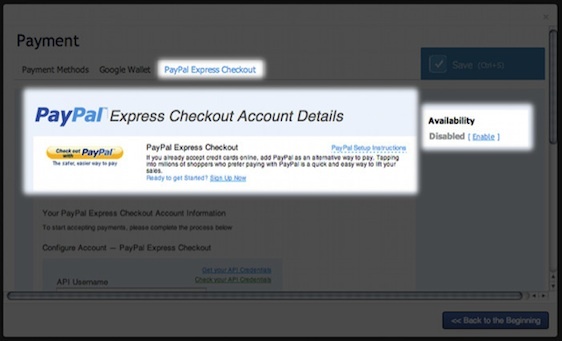 The two most popular gateways are PayPal and Google Checkout. To use either of these with the Online Store, you can simply sign up for a merchant account. Once you have your account set up, you can add a payment method, or edit existing payment methods, in System Settings > Payment. You then need to process this information, and once payment goes through, you can fulfill the customer's order. Online methods process payment immediately, and would apply to methods such as credit cards and PayPal transactions. Go to System Settings > Payments > Google Wallet. Add your Merchant ID and Merchant Key in the fields provided. Select the types of payment methods you'd like to use. 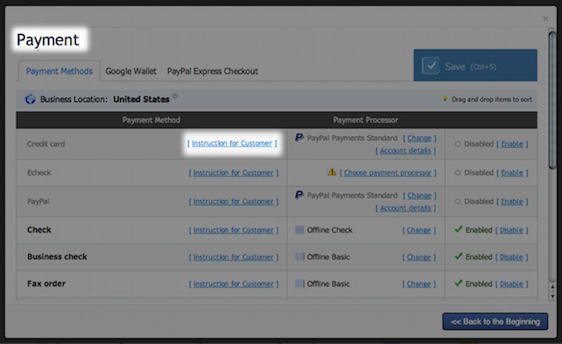 Go to System Settings > Payments > PayPal Express Checkout. Go to System Settings > Payments. The store URL is the web address of your store and can be added to business cards, and email signatures. It is an optional feature, although some features do rely on it. Once you have published your site, and log into the Control Panel, you will be reminded that you should set your store URL. Enter the URL of the site to which you've added your Online Store. Click Save to finish. Custom table: Customize your shipping costs by weight, number of items or cart total. Carrier-calculated: Automatically calculate costs based on carrier rate tables. For a detailed explanation of the difference between the methods, and to give you an idea of which method is best for your store, visit the Ecwid Knowledge Base Shipping article. Go to System Settings > Shipping. Select the shipping region and then select the shipping method you'd like to use. To activate a shipping option, click Enable. Shipping costs are generally calculated on weight and distance, so if you are selling a tangible product it is important to configure your product weight correctly. This will ensure you receive the correct carrier-estimated cost of delivery. 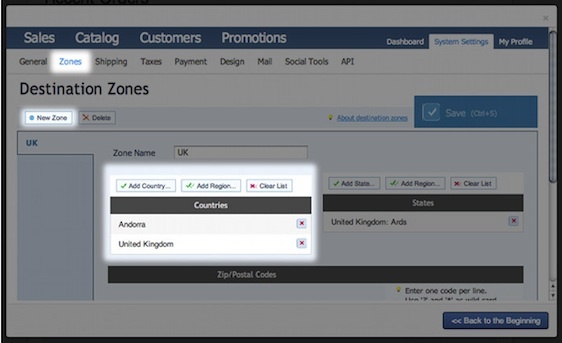 Destination zones are used for shipping and tax rules when you are setting up your shipping methods. Go to System Settings > Zones. You can also create them at a later stage if you're not sure about your shipping plans yet. Once you have saved all your options, go to your site in the Sitebuilder. Drag and drop the Online Store Widget onto your page, and your online store will be displayed. Take a look at our tutorial on Basic Customization (to come), to get started with changing your currency and adding product options.